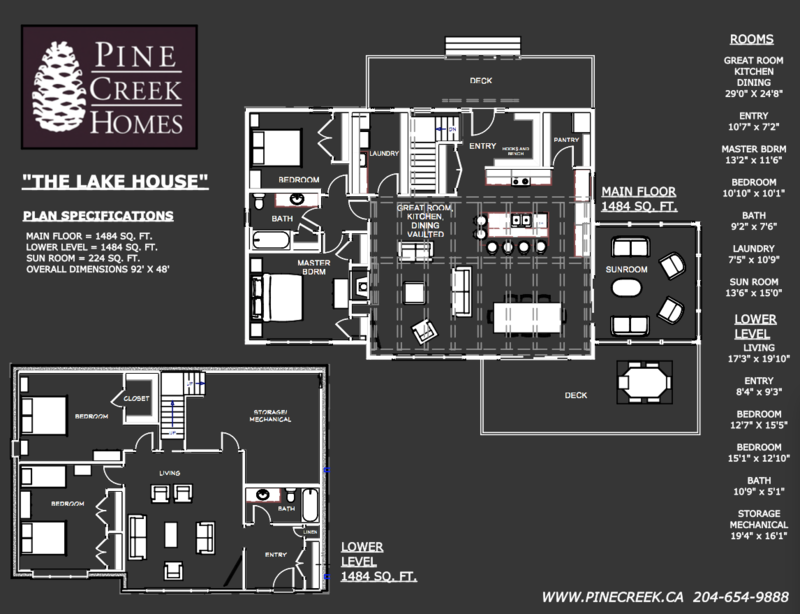 Main Floor: 1484 Sq. Ft.
Sun room: 224 Sq. Ft. 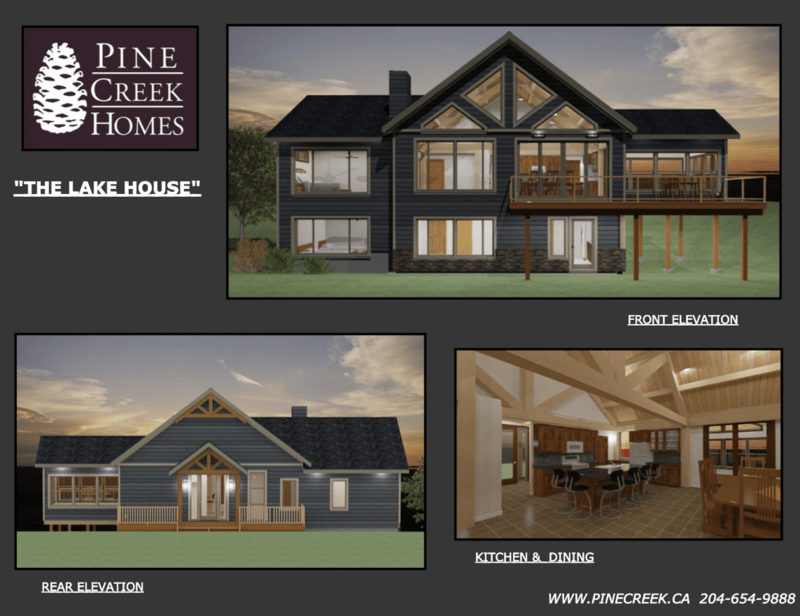 Ever since the Lake House design was created, this four bedroom, two bath walkout has got a lot of attention, and for good reason! Originally designed as a cottage, the walkout was designed to face the water, along with the rest of the windows. This design was created for the purpose of spending time with family and friends at the lake. With two bedrooms and a separate living area downstairs, it lends itself perfectly to having another family, or kids and grandkids out at the lake. When walking into the cottage from the roadside, there is a large entry filled with benches and coat hooks, as closets in an entryway never seem to get as much use as coat hooks at the lake. Walking through the entry into the great room, you immediately start soaking in the natural light from the massive great room windows. The main floor great room is wide open with high vaulted timber frame ceilings throughout, centered around a wood burning fireplace. With space for a large dining table, and plenty of chairs around the eat-in island, entertaining at this cottage is a dream. An oversized pantry has plenty of room for food storage, as well as an extra fridge, which always comes in handy at the cottage. The master bedroom sticks with the theme of natural light, with an oversized window overlooking the lake. Waking up with a view is such a treat. The sunroom in this design is fantastic. With full windows all the way around, it not only takes in every view the property has to offer, but also maximizes sunlight and airflow at the same time. With a large deck in front of the sunroom, there’s also plenty of space to get a suntan on those beautiful summer days and BBQ on those beautiful summer nights.